Manufacturers of NFC devices can now submit their products to approved test houses and those that pass the required compliance tests will be able to place the NFC Forum Certification Mark on their hardware and packaging to prove that they conform to NFC standards. The NFC Forum has completed work on the first ‘wave’ of its device certification programme, enabling manufacturers of NFC devices to submit their products for testing. Companies whose devices pass the certification process will be able display the NFC Forum Certification Mark (PDF) on their websites, manuals, marketing and packaging materials to denote compliance and will also be able to list certified products on the Forum’s website. In this first wave of testing, devices will be tested for compliance with lower-level digital protocols, including existing tag operation specifications and new NFC digital protocol and NFC activity specifications. The second certification wave, scheduled to launch in 2012, adds testing for the physical layer and selected upper-level digital protocols, including the key RF analog and peer-to-peer specifications. The long term goal of the association has always been to put a compliance testing process in place to assure purchasers that devices meet standard requirements and to encourage manufacturers to enter the market, Paula Berger, executive director of the NFC Forum, told NFC World. “This is a major milestone for the NFC Forum and a major step forward for the industry,” she explained. While the compliance tests are designed to prove that a device meets NFC Forum specifications, however, in this first wave devices will not be tested for interoperability with other NFC devices. This may become a requirement at a later date, says Matt Ronning, chair of the Forum’s compliance programme. In the meantime, device manufacturers will be encouraged to participate in regular ‘plugfests’ where they will be able to check the interoperability of their devices with those of other suppliers — but certification will not be denied based on plugfest results. 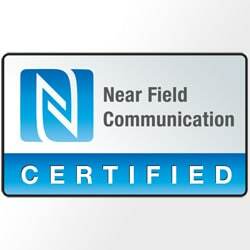 Only companies whose products pass certification testing will be able to display the Forum’s N-Mark on their devices. Introduced in June 2009, the N-Mark is designed to be a universal and instantly recognisable symbol for NFC. It is specifically to be used to tell consumers where to touch to initiate NFC services on a device and where they should touch their device on a poster, sign, badge or label to trigger NFC services. To have a device certified as NFC Forum compliant, manufacturers must be members of the organisation at least at Implementer level. They can then choose to submit their device for testing at one of eleven labs that have so far been approved by the NFC Forum. Alternatively, they can buy in their own test tools from an approved supplier and then perform compliance testing in-house. Either way, the results are then submitted to The Open Group, a vendor-neutral and technology-neutral consortium who will serve as the certification partner for the programme.